Arrowhead Golf Club wants you to book your wedding here! Couples are moving forward and selecting their preferred venue so they can send out invitations and start the planning process. 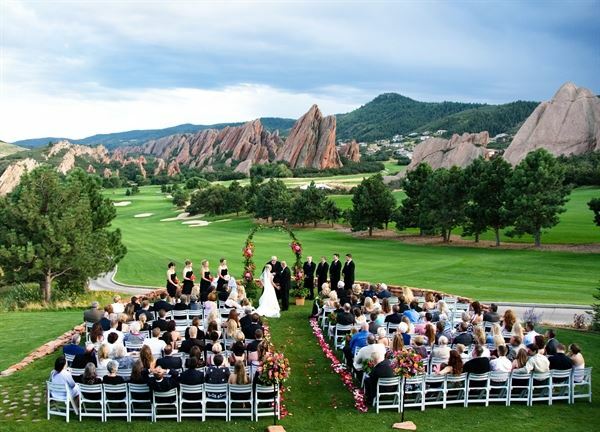 We want to ensure that Arrowhead is the right fit for you and your fiancé and let the fun begin…Arrowhead Golf Club is nestled in the striking flat irons of Roxborough Park and our Red Rock views can take a person’s breath away. Your wedding guests will forever remember the majestic, Colorado backdrop that framed your special day. Everyone is left with an experience that is genuinely one-of-a-kind. Booking your wedding at Arrowhead means you can have a mountain wedding but still offer your guests the daily conveniences of city life. We take care of the preliminary planning with you (creating floor diagrams, recommending vendors, outlining timelines, detailing your event-day vision).